The child, Ta'shawn Gallon, was struck by a stray bullet in Durkeeville back in February 2018. His family said Monday they were not aware JSO issued a ruling in his death. 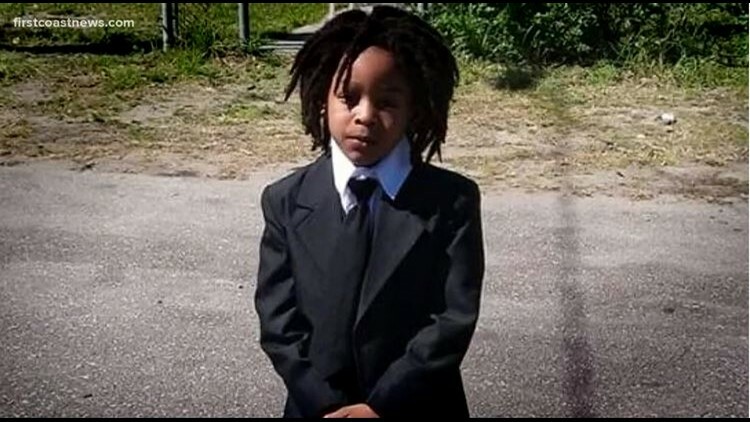 JACKSONVILLE, Fla. — The Jacksonville Sheriff's Office "cleared" the death of a 7-year-old Jacksonville boy as "excusable," according to JSO's transparency website. The child, Ta'shawn Gallon, was struck by a stray bullet in Durkeeville back in February 2018 during a shootout. The child's family was not aware of JSO's new status in the case, a family spokesperson told First Coast News on Monday. JSO said they did not have information on the case and that details would be available via public records. Information from the records will be added to this story as soon as they are obtained. JSO's transparency website originally listed the death as a "justifiable" homicide. After this article was published Monday morning the ruling was changed on the website to "excusable" death. JSO says an excusable homicide is "a killing by inadvertence and without criminal intent on the part of the killer." JSO Sheriff Mike Williams said days after the shooting that Ta'shawn was one of six people in the front yard of a home in the 1300 block of Herman Street when a silver SUV pulled up and began shooting at the crowd. During the shooting, another victim reportedly returned fire while Ta'shawn was caught in the crossfire. The child was transported to a local hospital with a gunshot wound where he later died, JSO said. The person behind the fatal shot is still unknown. An adult victim, Dominique Holcomb, was injured in the gunfire. He was treated for his wounds but would not cooperate with police at the time and was arrested on a previous warrant for being a convicted felon in possession of a firearm.